We know what air fresheners in cars are supposed to cover up. These are absolutely not the things you set out to smell on purpose like you would do with a rose. However, anyone who ever left a taxi (or a friend’s car) with a massive headache or a nauseating coughing fit, would rather just have opened a window. Even if it rained; even if it snowed. Snow! A blizzard seems like a welcome alternative when the air you breathe is a fake citrusy or fir-like or spicy olfactory nightmare that makes you feel dizzy and sick. Listen to the man, people. Listen to the man. Granted, purest essential oils can lead to allergies. That’s a thing to remember. Essential oils do have effects – and side effects too. But something tells me that allergy sufferers don’t use conventional air fresheners anyway. So what’s that alternative, organic car air freshener I wanted to talk about? Certified with Demeter and Natrue, the Baldini Guardian Angels by Taoasis look like a purple figure sitting in the lotus position. 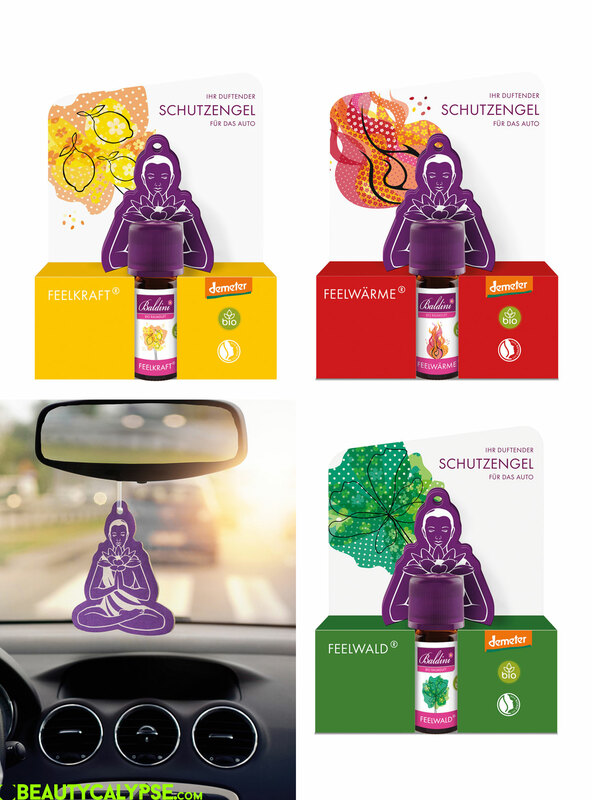 Three sets, €6.40 each, are available, each of them including a cardstock figure and a 5 ml bottle of essential oil blend: Feelkraft (lime and lemongras), Feelwärme (blood orange and vanilla <3) and Feelwald (swiss pine and cypress), respectively something like feel the power or the strength, feel the warmth and feel the forest. If you’re a long-time reader, you might know, I quite like to breathe 😉 But if you’re new – or missed them, do read A Breath of Fresh… Death about outdoor air pollution and what each of us can do about it (other than living in the woods) and discover why “fragrance” is still a single ingredient in What Does ‘Fragrance’ Even Mean?. I’ll also talk about indoor air pollution soon, and how we can improve our homes the ecologically savvy way. At the moment I am using lavender bags in my not really used car… Do you know how long the scent is lasting on the figure? Can’t wait for the indoor air pollution post. I like the look of the Guardian Angels, and I am sure I would like the fragrance. I can’t bear the other car fresheners. I’m sure you would like it! I get sick from most conventional air fresheners.